Find more Calgary sports and recreation. If you are trying to get in shape and want a really good all-round exercise, have you thought about following a boxing fitness program? Following a boxing fitness program is a growing trend not only in Calgary, but in many places. It increases your agility, stamina, co-ordination as well as being a very good upper-body workout with all those jabbing and punching moves. You might find it much more fun than just going down to the gym for a regular workout and it can actually work to get ya in shape, at long last! Here's an efficient way to get that 6-pack. If you're interested in finding out more details, why not go down to Teofista gym, at unit 21, 5720 Silver Springs Blvd., Calgary, AB T3B4N7, or check out their website at www.teofista.com. This map has places to check. 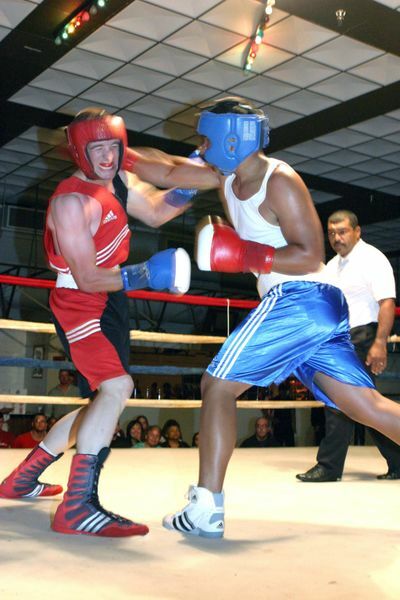 Boxing as a spectator sport has also been growing in popularity over the years. Although it has had quite a reputation at times, the recent promotional activities to show boxing as less of a blood sport combined with the changes in rules, are working to widen its viewing audience. A far cry from Sylvester Stallone in those Rocky movies. Or even Stampede Wrestling. As far as Calgary is concerned, the fact that back in 1988 the Olympic Games were held in our glorious city, has also helped increase the popularity of this sport by giving people a chance to see a different side to boxing. For those of you more interested in watching a boxing match than working out, your best bet would be to contact Impact Boxing Club at 435b 10th Ave, SE Calgary, or Teofista gym. Alternatively try this: www.boxrec.com/schedule.php?country=CA, as they have details of the Calgary boxing events, as well as those a bit further out. If wrestling is more your style than boxing, well you're not quite forgotten. To be honest, there's not so much demand for wwe events (or you may still know them as wwf events) compared to other sports, so most are organized outside of the area. This sport has roots in Calgary, with Bret Hart, the late Owen Hart and the rest of the family. Nevertheless, on one of those infrequent occasions when a tournament is arranged in the city and TV cameras are rumored to be in attendance, there is a noticeable demand for tickets to the event and the tournament is the subject everyone is knowledgeable about. But getting back to boxing. Whether you are just a spectator, looking to take up the sport either at amateur or professional level, or are just interested in a good fitness workout, Calgary boxing clubs can offer you almost everything, if not everything, that you are looking for. Go back from Calgary Boxing to the Internet Site Map web page.